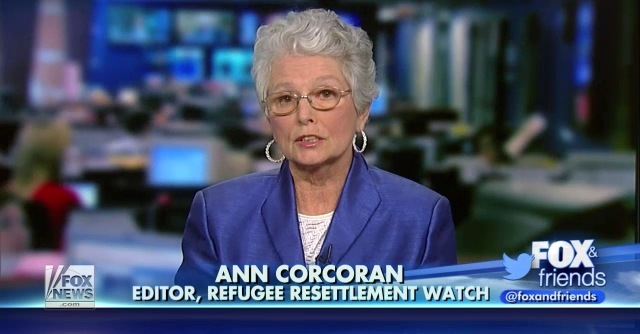 Maryland’s diminutive and unassuming private citizen, Ann Corcoran, has been writing about refugee resettlement on her now-famous blog, Refugee Resettlement Watch, since 2007. Without her work it is highly doubtful we would know nearly as much about this dangerous and wildly out-of-control program. To know her, listen to her, watch her on TV, she reminds you of a kindly grandmother, quietly but assertively lecturing us to eat our porridge. You could never imagine the ire she has aroused among the radical Left and their allies in the refugee resettlement industry. She wrote a short book three years ago, Refugee Resettlement and the Hijra to America, which is still in the top 30 in the immigration category at Amazon. A short video produced to promote the book has been viewed over 2.9 million times. Her blog has thousands of entries on everything from the refugee resettlement budget and the despotic, arcane, and highly secretive process by which refugees are resettled into this nation, to the horrific crimes and terrorism committed by these nice refugees that we foolish deplorables are so worried about. Her work inspired me to write my own short (and not nearly as popular) book, The Red-Green Axis: Refugees, Immigration and the Agenda to Erase America, and the (not nearly as popular) promotional video to go with it. She even attended a meeting in Pennsylvania where representatives of the U.S. State Department and HHS’s Office of Refugee Resettlement spoke of “pockets of resistance” to refugee resettlement cropping up around the country. We know that many of those “pockets” became motivated by following Ann’s blog. I subsequently organized a group we jokingly called the “pockets of resistance” to mock the industry. But they were no joke. One of those “pockets” recently threw out a five-term mayor who ignored public sentiment on refugees. Yes to all you refugee resettlement industry “stakeholders,” we natives who pay for all of this crap are getting restless. To be clear here, refugees are resettled in the U.S. through a network of nine primary and 320 affiliate private contractors paid by the head to resettle refugees. In other words, the federal government incentivizes them to resettle ever more refugees in an endless stream. Since Trump reduced the annual refugee resettlement cap to 50,000 in 2017 and 45,000 in 2018, the contractors have been wailing ceaselessly about their loss of business. What they don’t tell you is that when you add in other “refugee” categories, like asylum, the Unaccompanied Alien Children program, Cuban/Haitian Entrants and Special Immigrant Visas, the total is more like 150,000. Crocodile tears. And many of these “refugees” are not refugees at all, but economic migrants and others looking for a free ride. Fraud in the refugee and asylum programs is off the charts. In other words, using our tax dollars, they do what all leftists do when confronted with an effective opponent. They waste no time vilifying and smearing that person regardless — or perhaps because of — the factual information the person brings to the table. Now, you have to marvel at such cheek. The goal for immigrants has always been to assimilate. They are required by longstanding law to learn English, understand the Constitution and swear their allegiance to their newfound nation to become citizens — as well they should! But Foreign Policy apparently knows better! “Assimilation” is suddenly the code for racists and Islamophobes. What’s more, FP even cites the SPLC for its proof! The Left has been trying for years to undermine the “assimilation” principle. Championing the slogan “diversity is our strength,” leftists and their allies in the open borders movement advocate “integration” not assimilation. Why? Because their true goal is anarchy. They strive to turn America into an “ungovernable” Tower of Babel. And they will of course be supported at the polls in their efforts by “New Americans” who can come to the U.S., be set up with welfare benefits, special grants and employment preferences unavailable to Americans, without even having to learn English! We need rules, institutions, and support to enable people to integrate into cohesive communities and for the avoidance of doubt, I don’t mean assimilation, I mean integration, and there’s a difference…People shouldn’t have to drop their cultures and traditions when they arrive in our cities and countries. But that defines the problem in Europe, where mostly Muslim immigrant communities have walled themselves off and refuse to assimilate, creating their own separate legal system and “no go zones,” where police dare not tread and terrorists plot with impunity. According to both international and U.S. refugee law, people like my great-grandfather have for decades been candidates for refugee resettlement based solely on their well-founded fear of persecution in their home countries. Their ability to ‘assimilate’ — learn English and embrace the customs of the United States — had no bearing on their asylum applications. The Left excels at lying. If you can’t make the argument with the facts, change the facts. The statement above is true. It is also irrelevant. Asylum applications don’t include a requirement to “assimilate,” but the hoped-for citizenship that comes with it requires assimilation as it does with all people who apply for citizenship. It is also something all immigrants like her great-grandfather strove for immediately because it was the ticket to success in their newly-adopted nation, as it would be in any nation. I suspect Wolfe’s great-grandfather would be on Trump’s side in this issue and be appalled at his descendant’s base dishonesty. Once again, the Left stands reality on its head. Notice how the word “erase” has been worked into their lexicon. I have not heard them use it before. This may be in response to the book I wrote. I’m not flattering myself. They dissect every bit of opposition literature, no matter how obscure, and a key strategy employed by the Left is to accuse others of what they are doing. 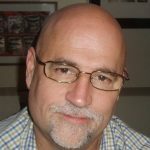 The refugee resettlement program, asylum, the unaccompanied alien children program, the diversity visa and other programs seek to import foreign nationals from hundreds of other nations for the specific purpose of erasing America’s national character to both dilute traditional America’s political power and weaken our national resolve. The job of refugees is to assimilate. No one demands that they abandon their culture. But they must assimilate to become Americans. To the Left, “diversity is our strength” precisely because it weakens and dilutes American culture, its constitutional underpinnings, the rule of law and everything about Western society they despise, i.e. the part that makes us exceptional. Antifa, the Revolutionary Communist Party, and the other street thugs now making daily showings in the news, are simply the ugly front of this burgeoning movement. If they can’t win at the ballot box — and they are losing everywhere as Americans come to realize what they are up to — they will try to win by replacing the voters and ultimately replacing our entire society. They want us to forget who we are, and if they have their way, there will be no real Americans left to remember. God bless Ann Corcoran for what she has done and continues to do — for no compensation and to no fanfare — just as you would expect your loving grandmother to do for you. Foreign Policy has now jumped into the fake news realm with both feet and joined the legion of leftist hacks who use vilification and slander to smear opponents rather than offering any credible counterargument. What a disgrace.